Re-Enable is an excellent utility which can help users recover from malware and virus attacks which have disabled certain Windows services and tools like the Registry Editor, "File > Run", context menus and the system Control Panel. The layout of the program can be described as nothing less than easy and simple-to-understand. 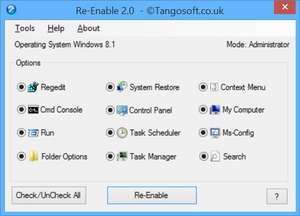 The main options available from Re-Enable are to re-enable utilities such as: Regedit, Cmd, Run, Folder Options, System Restore and a bunch of other tools which can be used to eradicate viruses. All it takes to get your system utilities back is to check and uncheck the options you want back and then click "Re-Enable". Version 2.0.1.0 is a freeware program which does not have restrictions and it's free so it doesn't cost anything. For security reasons, you should also check out the Re-Enable download at LO4D.com which includes virus and malware tests. Additional screenshots of this application download may be available, too.